DMV.com was created to help simplify your life by providing you with all the vehicle related information and Indiana DMV services you may need, in one place. Quickly find information and services regarding driving records, vehicle registration, drivers license renewal, license plate renewal, getting a learners permit, and finding a Indiana Department of Motor Vehicles approved traffic school. The Indiana BMV requires new drivers license applicants to meet several criteria. Learn about IN drivers license eligibility and guidelines. Request an Indiana DMV driving record from home. Ordering IN driving records online is the quickest way to view your DMV driving history. The Indiana BMV must verify that all drivers have auto insurance. Compare car insurance rates online to find affordable car insurance in IN. Taking a BMV approved IN online driver safety course enables drivers to remove demerit points. Enroll in online traffic school to get the benefits. An IN DMV practice exam helps you pass the license exam. Take an online DMV practice test to gauge your understanding of IN driving laws. 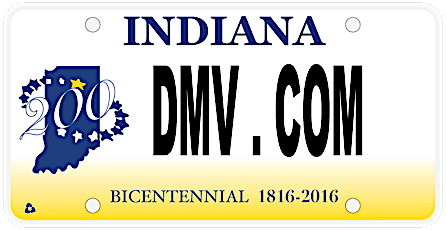 The BMV requires vehicle registration for all car owners residing in Indiana. Find BMV car registration info, including renewal services. Passing Indiana drivers ed enables teen drivers to receive their permit and license early. Enroll in online drivers ed approved by the BMV. Learn how to get a car title bill of sale from the Indiana DMV. A bill of sale serves as an official record when you sell or purchase a car. If Indiana traffic tickets go unpaid, a driver faces penalties from the DMV. Learn how to pay a ticket online in Indiana quickly and easily. Indiana DWI penalties, such as license suspension, are administered by the BMV. Find more IN DWI information, including Indiana’s DWI laws. Buying a car in Indiana can be a stress-free experience. Buy a new car or used car online, and learn BMV guidelines for new car purchases. Indiana DMV services can be obtained at a DMV location near you. Find Indiana DMV contact information, and make an appointment today. Solve your motor vehicle issues online. Let DMV.com guide you through the most up-to-date database of drivers license, vehicle registration, license plate, emissions and any other vehicle related info. If you’re in dire need of learning how to pass a driving test, file for renewal of driving license or solve any other issue you may have while owning a vehicle in Indiana you’re on the right place. DMV.com offers you the latest and easiest guide to the Indiana Bureau of Motor Vehicles. As a site that’s not affiliated with government agencies, getting you on the right track in your search for relevant dmv information without wasting your time is our priority. All you have to do is just type in what you’ve been looking for in the Search feature above or go through the web by using the navigation sections. Whatever way you choose you’ll get the precise info in no time. We’re absolutely positive that our large electronic database filled with descriptive articles, how-to-guides and various forms will help you meet all the Indiana BMV requirements with ease. DMV.com is a privately owned web that spares you from unnecessary bureaucracy. Here you’ll find what you need fast and in a format that’s simple to understand. We encourage you to speak your mind and tell us your experience in solving your vehicle problems. Follow us on Facebook, interact with us and thus help us become more efficient.